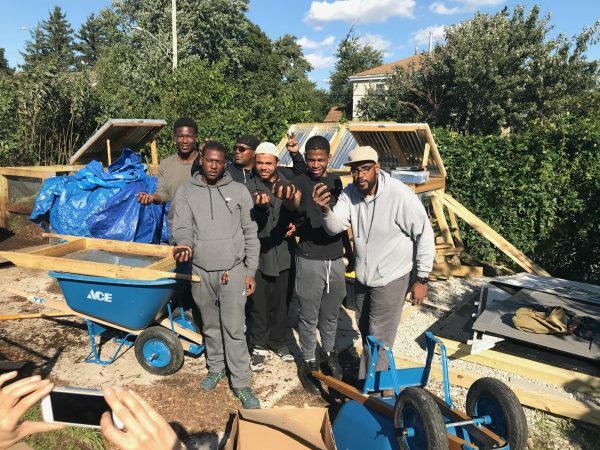 This past fall, we took our first cohort of apprentices with the Urban Roots Apprenticeship to a composting workshop led by the Baltimore Compost Collective, a small youth empowerment and composting nonprofit located inside the Filbert Street Community Garden in Curtis Bay. Over the past few months, it has been a pleasure getting to know the folks involved in this project, who are working everyday to advocate for cleaner air and fresher food for their community. The garden is an oasis in a community that lacks access to fresh food and fresh air. The Curtis Bay zip code has ranked as one of the worst in the state for toxic air pollution, and for respiratory problems caused by toxic air pollution. When visiting the garden, it is not difficult to see why this is the case. As you step out of the community garden and walk toward the bay in the direction of the local community center, large mounds of coal and smokestacks stand in contrast to the surrounding waters of the bay. The CSX Chesapeake Coal Terminal divides the community from the bay, and farther off in the distance lies Baltimore's biggest air polluter -- the trash incinerator. The community is committed to advocating for environmental justice and zero waste initiatives, and the Baltimore Compost Collective is a big part of this work. Below you can listen to an interview with the Compost Collective's Program Manager, Marvin Hayes, on how he works to educate youth and community members on composting to create a cleaner and greener environment for one of the most polluted areas of the city.